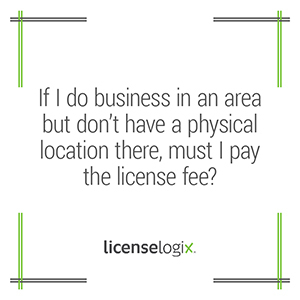 Certain municipalities will only require a business license for businesses that are physically located within their borders. Others require a business license for all businesses performing services in the jurisdiction, regardless of whether or not the business is physically located there. If your business is required to obtain the business license, you will also need to pay the business license fee as part of that requirement. LicenseLogix will research the business license fees and requirements for every jurisdiction in which you do business. Let the experts simplify the complexities of business license fees. Live chat with our license professionals or call 1-800-292-0909 today.